Travelling with: Rod Andersen, partner; Nicole Billante, best friend; Tristan Andersen, 14; Brianna (Bree) Andersen, 12; Laura Andersen, 8. I met my partner, Rod, about five years ago. I was 44 at the time and had no children – in fact, I had decided at a very early age that I did not want children. Rod had three children, aged at that time 6, 10 and 12. They stayed with him for around five days a fortnight. And so, I found myself suddenly playing the role of stepmother. I was lucky in that Rod’s kids never had a moment’s resentment towards me and happily accepted my role in their lives. Before meeting me, Rod had travelled overseas regularly on business (you know the way, comfy air-con limo from airport to five star hotel and back, successfully avoiding any real exposure to the country being visited). 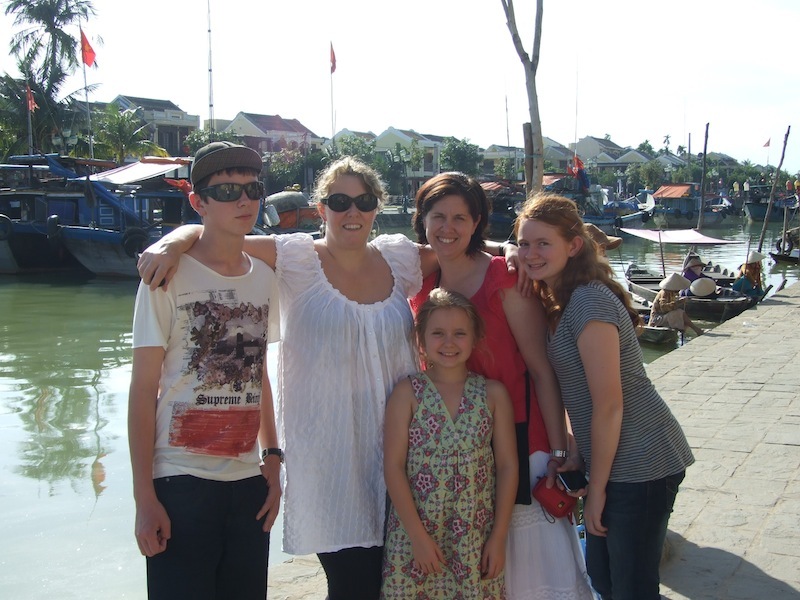 The kids had only left Australia twice – once to return to see their mother’s family in the UK when very young and once on a five-day trip to Fiji with us. I have been a passionate traveller all my life, having grown up with peripatetic parents and spent my childhood between Italy, the UK, Belgium, France and Australia. As an adult I’ve travelled extensively through Asia and Europe, backpacking when I was younger and flashpacking as I got older and comfort became more of a priority. I really wanted to share this passion with Rod and the kids and thought long and hard about the best place to start. I wanted to choose somewhere I had been previously so the family had the comfort of me knowing my way around (because while I thoroughly enjoy not having a clue where I am and where I’m going, I figured they might find that a little too challenging!). I decided on Vietnam. Not only had I loved the country, the people and the food on my previous trip, I had some ghosts to exorcise – on my first visit my then husband told me our marriage was over on the second day of our six week trip; on the fourth day I received a phone call telling me my father had died and on the sixth day I turned 40. While none of this coloured my love for Vietnam, I felt it would be nice to reframe my memories of it! As a relatively new stepmum, I was also apprehensive about my ability to deal with three children 24/7 for just over two weeks. I bribed my best friend to come with us – she’s an English teacher and has far more experience of children so I figured not only would she provide me with someone to vent to, she would also be a good source of knowledge and experience in child management. Plus the kids had met her before and adored her. And so, we set off…. My theory was that taking the kids to Singapore first would give them a taste of Asia “lite” and prepare them for the more full on experience of Vietnam. 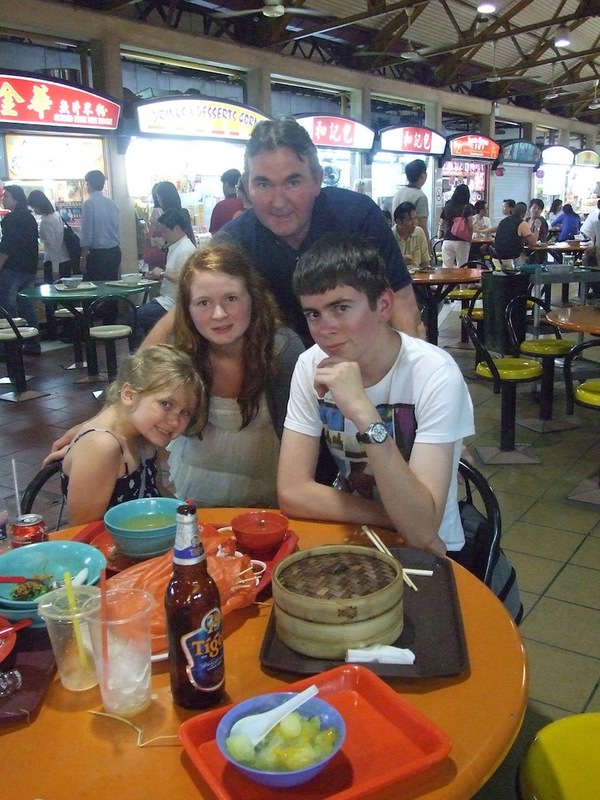 I was obviously completely deluded – they all loved the sanitised order of Singapore and apart from dinner in a food court (complete with Singapore’s highly efficient cleanliness classification system), they really got no exposure to anything even remotely resembling “real” Asia. We flew from Singapore to Hanoi, stayed there for a couple of nights before bussing it to Halong Bay. I used private hire buses/cars throughout the trip because of the kids – normally I’d have just grabbed whatever bus the hotel or local travel agent had to offer but that approach doesn’t always guarantee roadworthy vehicles and I felt I needed to ensure I returned them all to their mother in one piece! Two nights on Halong Bay, bus back to Hanoi, a couple more nights there, overnight train to Danang, mini bus to Hoi An, five days there then flight to HCMC for three final days including a day trip to the Mekong. I got a real kick from introducing the kids to such a different way of life and watching them blossom as culture shock retreated and real interest bloomed. The family as a whole loved the food. For most of the trip we stayed in 3-star locally run hotels. I’ve found even the cheapest accommodation in Vietnam to be clean but felt that Rod in particular might find anything less than 3-star a challenge (given that he’s usually in 5-star business hotels). We requested adjoining rooms as far as possible, or at least on the same floor. This worked most of the time and when it didn’t I played “mother lion” and encouraged the children to look forlorn and traumatised and we usually got one of the rooms moved so we were near enough. At the beginning the kids were apprehensive about being in a room on their own (the three of them shared as I felt I needed somewhere I could escape to), but as the trip continued and their confidence grew they became more and more comfortable with the arrangement. All the hotels we stayed in were fantastic, even though most of them weren’t the ones we booked – the travel company, who shall remain nameless, managed to stuff up pretty much every booking we made. On the plus side, we usually ended up better off, with the exception of the train from Hanoi to Danang. I had booked the first class tourist train with restaurant car, decent bathrooms etc. When we arrived at Hanoi station and walked onto the platform my heart sank – we were going on the local train (admittedly first class). I wish I’d had a picture of Rod’s face – sheer horror. Anyway, my friend Nic and I jollied everyone along and told them that this was part of the fun of travel, having unexpected adventures. As there was no restaurant on board, I did a quick dash to a stall on the station platform and stocked up on a bizarrely random range of foods including chips, mandarin oranges, cake bars, warm beer (for the grown ups – Rod seriously needed it by that stage) and warm fizzy stuff for the kids. Tristan, the eldest, refused to use the sheet and pillow provided and lay rigidly on the bunk (I did tell him that the sheet and pillow were significantly cleaner than the bunk, but he wasn’t going to listen). Rod drank warm beer (for an Australian, a true disaster), Laura got into the spirit of adventure, as 8 year olds do and poor Bree developed some sort of tummy bug and spent a large part of the trip leaning over a squat toilet vomiting onto the railway tracks below. Nic and I slept well in the second compartment, apart from the cockroaches who partied the night away on the table between our bunks. I think the key was not moving too quickly. We spent a minimum of three nights in most places. This gave the kids time to settle and not feel like they were constantly on the move. We also tried to get hotels with a pool where the weather warranted it (not in Hanoi as it was winter) and having a bit of time to play about in the pool at the end of a long hot day was a good way for them to decompress. I also think the ratio of one adult per child was really helpful (see my answer to the next question) as it meant that each child had someone of their own to hang onto when wading out into the chaos of Hanoi traffic and it also helped us to ensure that we didn’t lose anyone! I totally underestimated the level of culture shock the kids (and even Rod to some extent) would experience. 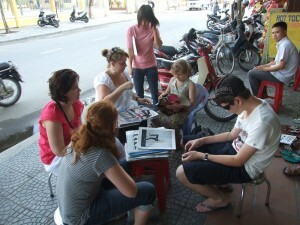 The first couple of days in Hanoi were really hard, the kids were scared of leaving the hotel. I’d deliberately booked in the centre of the old town (this was the only booking the nameless travel company got right) because, to me, it’s the best bit. For the kids, it was noisy, dirty, smelly and scary. There were no pavements, no pedestrian crossings and mopeds everywhere. By the end of day one, Bree was texting her mother in tears wanting to come home. The good news is that by the end of the holiday she was already planning to return to Vietnam when she was 18 so she could see more of it! Two really stand out here and both came about by pure chance. The first was New Year’s Eve. We had booked a cruise on Halong Bay for the 29th/30th December. When we got to Hanoi, we received a message from the travel company’s local representative to the effect that they’d got our booking wrong and we would have to go on the 30th and 31st, but they would not expect us to pay the New Year’s Eve premium as it was their mistake. We weren’t overly bothered – it just meant we had three days in Hanoi before Halong Bay and two after rather than the other way round. The best part of it was that we got to go to the New Year’s Eve dinner, which took place in a cave in one of the islands in the bay. The cave had been fully kitted out with lighting, linen covered tables for 10 and an enormous buffet – it really was magical. There was a traditional dance show, which the kids loved (particularly Bree who is a keen dancer herself). I think it was particularly memorable as it was totally unexpected. We were the scruffiest there as everyone else had known they were going to a gala dinner – mind you, we were probably also the warmest! The other, and this is something we still often talk about, was sitting on the balcony of the hotel after we returned from Halong Bay (a hotel we would never have been in were it not for yet another travel agent stuff up). The kids were writing up their travel diaries and the adults were enjoying a COLD beer or two while we watched the traffic circling the park below. We started a competition to see who could spot the most ridiculous thing on a moped. We saw fridges, entire families, chickens, dogs – you name it. The guy who won had a full size door in front of him with his hands stuck through the empty top two panels, peering round the central panel to see where he was going. He had his wife and child behind him. The man with the giant teddy bear scored well with the kids too. I love Hanoi old town and always will, but I think for the whole family, Hoi An would be the top of the list. The lack of motorised traffic in the old town meant the kids could relax and enjoy looking around more. They also got to go to a tailor and a shoe maker and design themselves an outfit to be made which, for the girls in particular, was a major excitement. Despite becoming a bit ‘Disney’, Hoi An is still a beautiful place and my only regret was that we weren’t there for the full moon festival when scooters are banned from the old town, electric lights are replaced with silk lanterns and people float little paper boats with candles down the river. On our first night in Hanoi I think the kids would have refused to leave the hotel if it had had room service, but it didn’t so I dragged everyone out to a nearby restaurant. It was at the end of an alley, which was full of parked mopeds, and as we walked down the alley I could see that Rod and the kids thought I had (yet again) completely lost control of my senses. It was a lovely, family run place that served really good home-cooked Vietnamese food. I ordered up a good array of the classics (fresh rolls, Hanoi spring rolls, bo luc lac, banh xeo, etc) and the family started a love affair with Vietnamese food which continues undiminished to this day. They also learnt that the best food isn’t always in the flashiest looking places! I would use Hong Kong as my taste of Asia “lite” rather than Singapore – I don’t know what I was thinking! 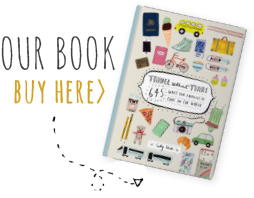 I’d probably also check the train booking more closely – I still, to this day, don’t know what went wrong and why we didn’t end up on the tourist train but I do remember thinking when I got the invoice that it wasn’t as expensive as I’d expected but never followed that up. Firstly, a realisation of what a privileged life they lead here in Australia; secondly, that things can be scary because they’re unfamiliar but that if you face your fears they get less scary and, ultimately, can even become fun; and finally, they discovered a real love of travel and, in particular, of Vietnam itself. That it was a truly life-changing experience for the kids. It opened up a world they didn’t even know existed. For me, I got such pleasure out of seeing them stop being afraid and start to really engage with the experience. I felt as if I’d given them a real gift that will change the way they live their lives as they grow up – Bree is already planning a gap year overseas and more travel after the finishes her HSC next year.